Having already made a Northerly detour to try out Bottega Louie, no one was particularly interested in traveling far for dinner. Heck, even I didn't want to get back on the freeways, especially during rush hour! So we did something that was purely out of convenience - eat at a restaurant just outside our hotel. Oh, the humanity! Has my culinary adventures sunk to a new low? In fact, it was at a place that we scoffed at while walking over to the nearby Target when we first checked into our hotel. 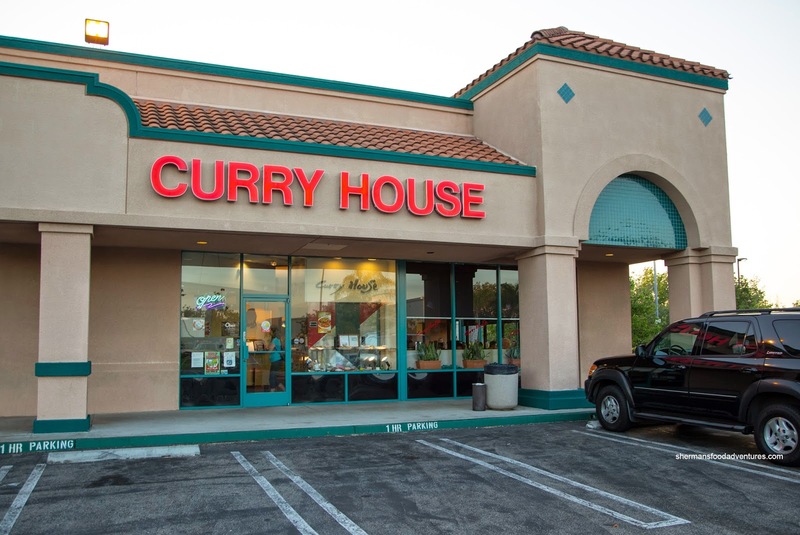 Pfft... Curry House, we won't eat there! 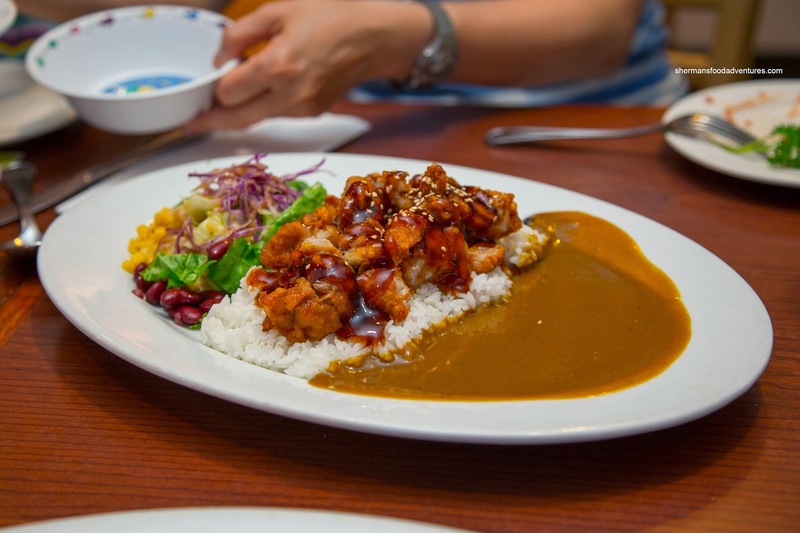 Well, we did and little did we know, the place features Yoshuku cuisine with an emphasis on Japanese Curry. For those unfamiliar, Yoshuku cuisine is Japanese-interpretations of various dishes such as pasta and Salisbury steak. Hence, you won't find sushi or the usual Japanese dishes here. 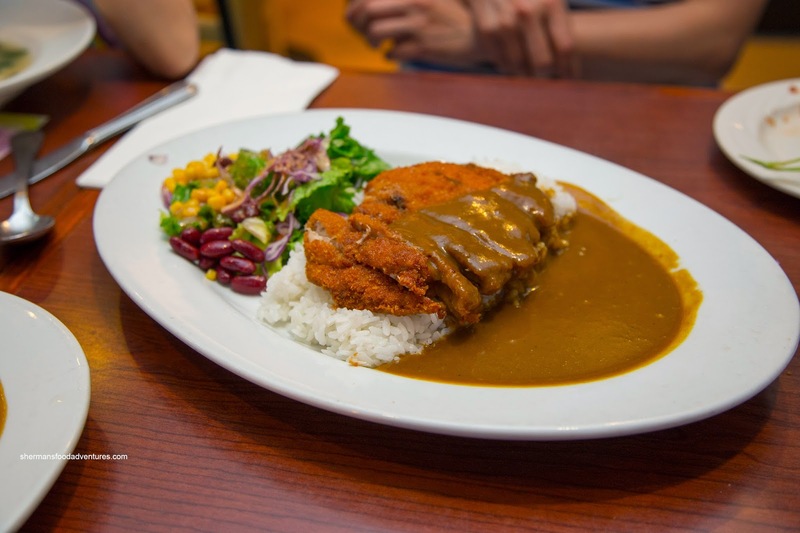 Oh and Japanese curry is typical more sweet than a traditional Indian curry. Viv started things off with the standard being the Chicken Katsu Curry with dark meat and mild sauce. Naturally, it was on the sweeter side, but not overly sweet. We could still taste the curry and a touch of spice. The katsu was crunchy while juicy and moist on the inside. 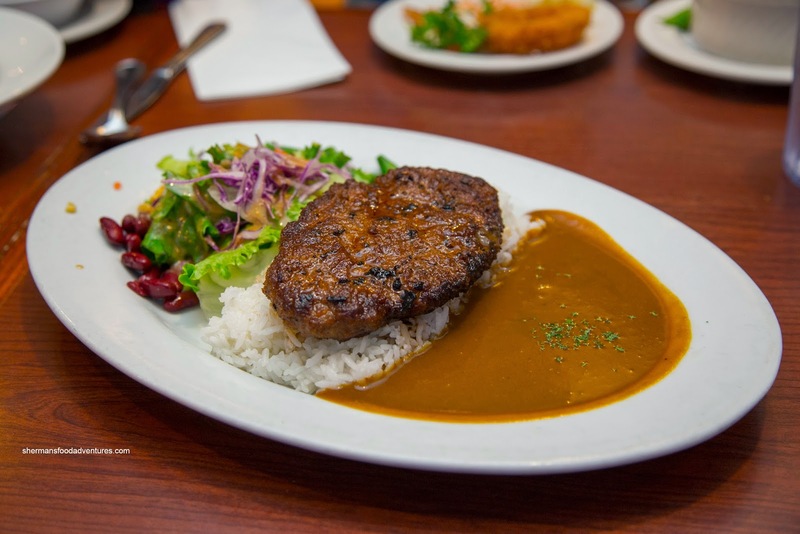 For myself, I had the Hamburger Steak with spicy curry sauce. It was only marginally more spicy than Viv's mild. The steak was really moist and tender with a good char on the outside. 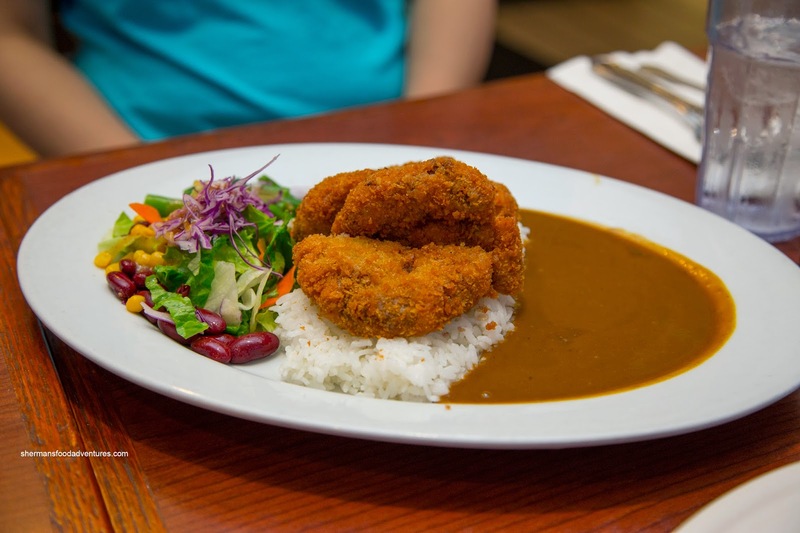 Elaine had the Menchi Curry which was essentially a hamburger steak coated with panko and fried. It was also juicy and tender with a crispy (not greasy) exterior. She went for the non-spicy curry and it was definitely more sweet than the one (due to the lack of spiciness, leaving it one-note in taste). 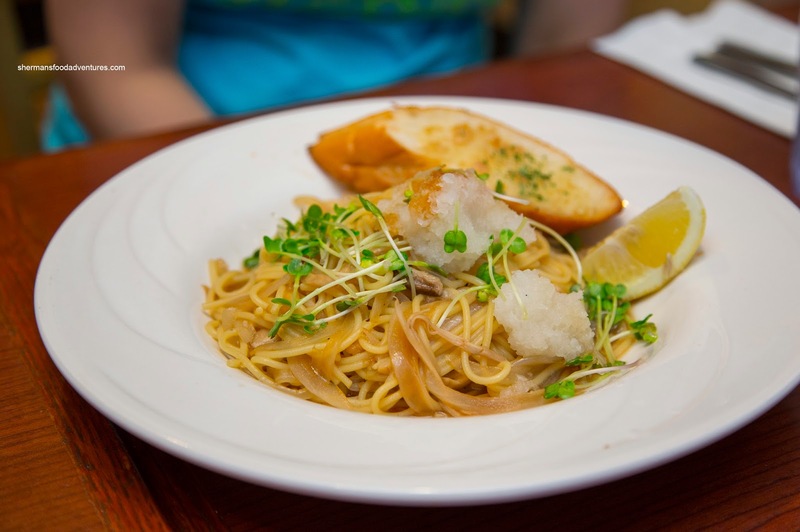 Costanza went for the Spaghetti with a buttery soy sauce. The pasta was firm with a slippery and mildly salty sauce. For me, I personally like the combination of butter and soy as it had this salty smoothness with a touch of sweetness. The squeeze of lemon was necessary as it lightened things up with acidity. 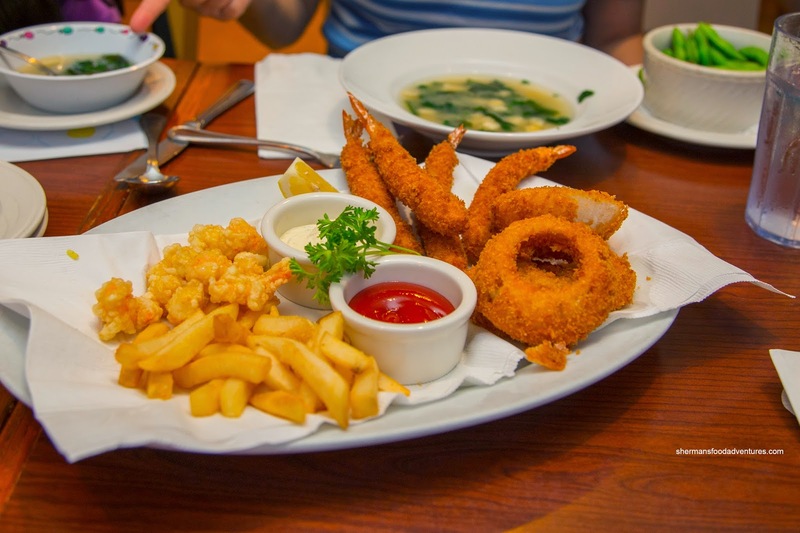 For the my son, he had the Appetizer Platter consisting of Popcorn Shrimp, Fried Shrimp, Fries and Onion Rings. The popcorn shrimp was not exactly crunchy where the exterior was soggy. However, the shrimp had a nice sweet snap. The panko-coated fried shrimp was very crunchy, yet a bit dense. Texturally, the shrimp was buttery with a slight snap. A big soggy, the fries were also quite salty. On the other hand, the onion rings were crunchy, well-seasoned and easy on the grease. Costanza's kids ended up sharing the Sesame Chicken with mild curry sauce. The chicken was appealingly fried where it was golden and crispy while juicy inside. We weren't sure about the teriyaki with the curry though. It was rather sweet on sweet. In the end, the curry overshadowed the teriyaki as it was the more dominant flavor. 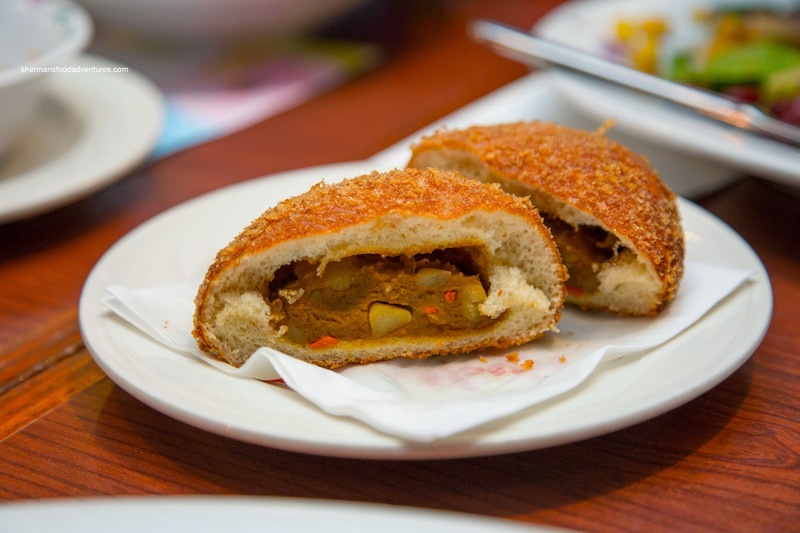 For curiosity's sake, Costanza decided to try the Fried Curry Bun. It looked more like a donut when it arrived, but it didn't eat like one. We found it dense, yet marginally crispy on the outside. The filling was fairly thick and mild. We weren't huge fans of it as it was heavy-on-heavy. Yet, we really didn't mind the other dishes, especially the curries. Definitely a surprise as we didn't hold out much hope for the place since we were unfamiliar with it. In the end, it accomplish more than merely filling our bellies as a restaurant based on convenience.